If you’re looking for a classic gift for children aged 3-5 look no further than the toy tea set. It’s a classic for many good reasons. Entertaining a make-believe tea party allows your child to take control and manage an event just like a grown-up. Even if the participants all happen to be dolls. It’s a great way for any boy or girl to feel they are “in charge” and that’s huge for developing their self-esteem. All they need for this wonderful game is one great toy tea set and I found the perfect one for you. 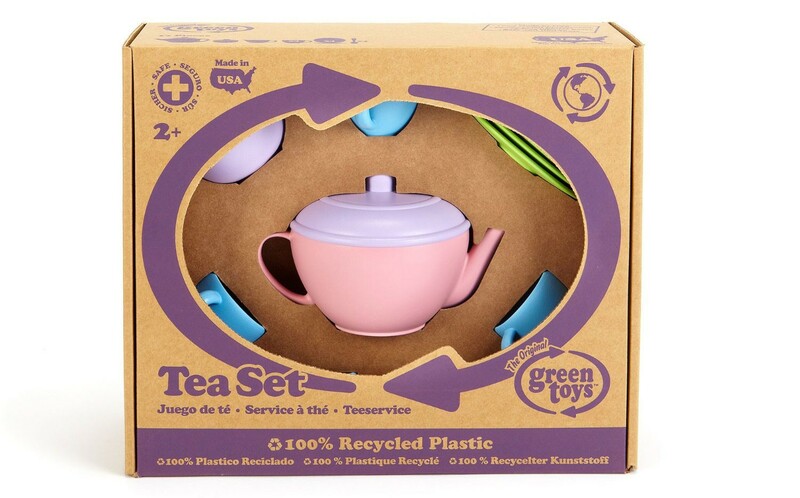 This toy tea set by Green Toys is simply perfect for a tea party of four! It includes a teapot with lid, sugar bowl with lid, creamer, four cups, four saucers and four teaspoons. The design is simply stunning. Simple, practical and in colorful pastel colors that will draw the attention of any child. This set is made in the USA from recycled material and is 100% safe to use for actual eating and drinking! It’s been approved by the FDA so you can be sure your kid is getting a safe product with zero BPA, phthalates, or lead paint. It can be used anywhere! In the kids’ room, outside on the lawn and even in the bath! It’s even safe for dishwashing! Did I mention this was just the perfect set? As with other products by Green Toys, this set is as eco-friendly as it is fun and practical. It’s made of recycled milk jugs and comes in a fully-recyclable cardboard box with no plastic parts. I’m so pleased I found this set! Most of the ones you see in stores look like fake cheap plastic ones but here is a toy tea set that was made to last. The materials are solid and the plastic is thick, so kids can play for hours on end without breaking or chipping the dishes. As I always say, the proof is in the pudding. This is a hit on Amazon. A best seller with literally over a thousand raving reviews. 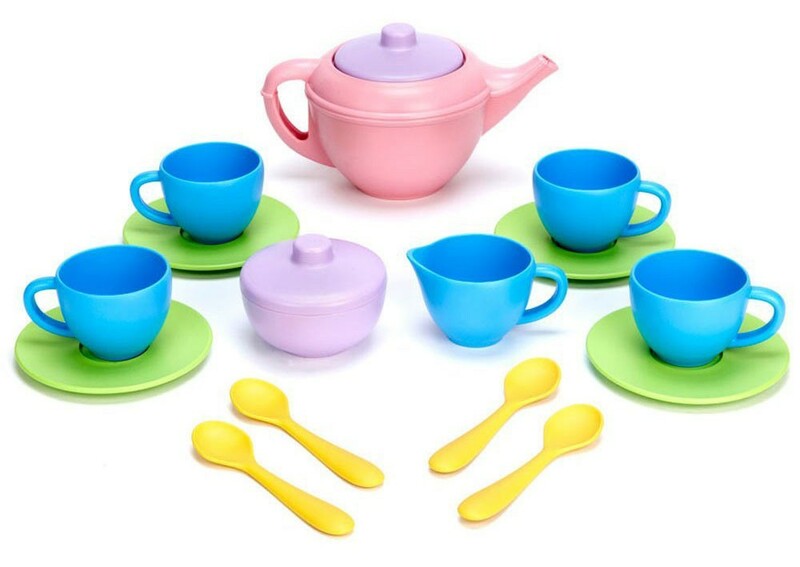 Everyone loves this toy tea set and if you’re looking for one, this is it. Any child would love to get this and you can rest assured your gift is top-notch in terms of safety and quality, and it helps saves the earth too! Click here to see more details and order this as a gift for your kids or for someone else. Previous Post:A Remote control race car track that’ll get your heart racing! I'm Anne and I'd like to invite you to subscribe to site updates by Gifts4Kids.net so that you never miss out on an awesome new gift idea! Lego compatible building blocks – Why pay more? 7 Novelty Coin Banks For Kids: Don’t Save Up On Fun! A Remote control race car track that’ll get your heart racing!